(Nanowerk News) Cuban chemists have made a biosensor to detect the stimulant xanthine, found in drinks such as coffee, tea and cola. Reynaldo Villalonga at the University of Matanzas and colleagues used a supramolecular approach to construct their biosensor. 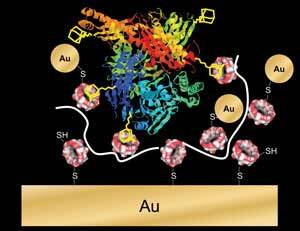 The researchers covered a gold electrode with polymer-coated gold nanoparticles. The non-covalent, supramolecular interactions of the enzyme xanthine oxidase with the polymer-coated particles resulted in the immobilisation of the enzyme on the electrode. 'We have shown for the first time an enzyme electrode made via supramolecular associations,' said Villalonga. The enzyme modified electrode was then used as a detector for xanthine. The device produced an electrical response to the oxidation of hydrogen peroxide, a by-product of the metabolism of xanthine by the enzyme. 'Xanthine was selected for this study ("Amperometric biosensor for xanthine with supramolecular architecture" – free access) due to the importance of its biomedical quantification for the diagnosis of several diseases, such as xanthinuria,' said Villalonga. This genetic condition means patients are unable to metabolise xanthine, leading to kidney failure and the formation of stones. The group is currently working on generalising their approach to extend it to other enzymes. 'Our main motivation is to contribute to the Cuban health care system, providing new technologies for the construction of portable biosensor devices for the national population,' said Villalonga.